TP53 disruption in chronic lymphocytic leukaemia (CLL) is a well-established prognostic marker and informs on the appropriate course of treatment for patients. TP53 status is commonly assessed by fluorescence in situ hybridisation for del(17 p) and Sanger sequencing for TP53 mutations. At present, current screening methods for TP53 mutations fail to detect diagnostically relevant mutations potentially leading to inappropriate treatment decisions. In addition, low levels of mutations that are proving to be clinically relevant may not be discovered with current less sensitive techniques. This review describes the structure, function and regulation of the TP53 protein, the mutations found in cancer and CLL, the relevance of TP53 disruption in CLL and the current screening methods for TP53 mutations including next-generation sequencing. The protein p53 contains 393 amino acids and is encoded by the TP53 gene in humans. It is located on the short arm (p) of chromosome 17 (17p13.1) and possesses 11 exons, of which 10 are coding (figure 1). Schematic structure of TP53 gene. The TP53 gene is located on the short arm (p) of chromosome 17 (17p13.1) and possesses 11 exons, of which 10 are coding. P53 is a sequence-specific DNA binding protein that regulates transcription. The protein consists of two N-terminal transactivation domains with a conserved proline-rich domain, a central DNA-binding domain followed by a C-terminus. This encodes its nuclear localisation signals and a domain essential for transcriptional activity. The p53 protein, via two transactivation domains, binds strongly to several specific DNA sequences.6 7 MDM2, a negative regulator of p53, binds to the transactivation domain inducing an alpha-helical conformation thereby inhibiting transcription of p53.8 By translocating these genes during periods of cell stress, they become active, producing proteins involved in cell cycle progression and apoptosis.9 During genotoxic stress, p53 protein is phosphorylated by ataxia telangiectasia mutated kinase and prevented from undergoing MDM2-mediated degradation (figure 2). Under oncogenic stress, p53 is protected from degradation by p14ARF (alternate reading frame tumour suppressor) protein. 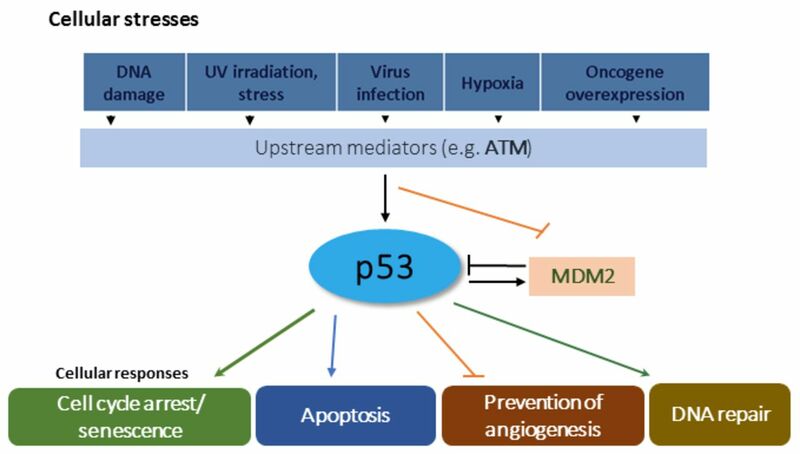 p53 function and regulation. ATM, ataxia telangiectasia mutated; MDM2, mouse double minute 2; UV, ultraviolet. TP53 is a member of a broader gene family including TP63 and TP73. Unlike TP53, both TP63 and TP73 do not have tumour suppressive capabilities. In eukaryotes, the p53 protein sequence is relatively conserved; however, TP53 has evolved by increasing gene dosage. Those affecting amino acids that contact DNA preventing wild-type transcriptional activity with major disruption to the protein. Those disrupting the three-dimensional structure of the protein. TP53 gene defects in CLL were first described in the early 1990s and the association with inferior clinical survival was established.19 Initially, the loss of the TP53 locus was not considered to be an important event in the era of karyotyping.25 However, this was to change with the publication of Dohner’s hierarchical CLL classification in 2000.26 This firmly established the inferior survival of patients with deletions of 17p13 (del(17 p)). This was subsequently confirmed in other studies and implemented into routine practice.27 While karyotyping required dividing cells, Dohner’s classification used fluorescence in situ hybridisation (FISH). FISH uses fluorophore-labelled DNA probes that hybridise to specific DNA sequences that allows the identification of deletions, additions and translocations. In contrast, TP53 mutational status was not initially assessed routinely in CLL diagnostics as it was assumed that TP53 mutations did not occur in the absence of del(17 p).28–30 With further studies, it became clear that del(17 p) is usually accompanied by TP53 mutations in CLL, and studies have shown that both can occur independently with the frequency dictated by the particular patient cohort studied and the methodology used. In general, 90% of patients with del(17 p) carry a mutation and up to 65% of patients with a TP53 mutation have del(17 p).31–33 Patients with a monoallelic TP53 mutation also have an inferior progression-free and overall survival.31 33 Of all patients with TP53 disruption, mutations and deletions occur together in the majority of patients with monoalleleic TP53 mutations accounting for another 40% of patients, monoalleleic deletions and also mutations with copy neutral loss of heterozygosity account for a minority of patients (figure 3). TP53 defects: loss of p53 function in chronic lymphocytic leukaemia can occur due to del(17 p) and/or TP53 variants. The most common cause of TP53 aberrations results in the combination of del(17 p) and TP53 mutation. For more than a decade, chemoimmunotherapy in the form of fludarabine, cyclophosphamide and rituximab was the conventional first-line regimen in fit patients providing a high response rate, improved progression-free survival and an impact on overall survival for the first time in CLL. Not all patients benefit from this treatment, with up to 25% of patients relapsing within 24 months, fulfilling the definition for chemorefractoriness.34 Fludarabine, a purine nucleoside analogue, interferes with DNA synthesis and repair in dividing and non-dividing cells and therefore requires a functional p53 protein to be effective. The presence of TP53 aberrations reduces progression-free survival due to chemotherapy resistance.29 30 The advent of novel treatment options in CLL targeting the B-cell receptor and antiapoptotic molecules targeting BCL-2 have proved beneficial in the treatment of patients with TP53 aberrations providing alternative methods for cell death.35–37 This therefore highlights the need for accurate assessment of TP53 defects to identify patients who will benefit from novel therapies. As TP53 mutational status has a major impact on treatment decisions, international collaborations such as ERIC have developed a network of TP53 reference centres within various countries. ERIC aims to provide standardisation and harmonisation of diagnostic strategies for TP53 mutational assessment resulting in robust testing strategies and offering quality assurance schemes. In conclusion, in CLL, the inactivation of the TP53 gene by either a deletion or a mutation has a negative impact on the disease course for patients. Detectable TP53 aberrations are markers of chemorefractoriness, and consequently, treatment decisions are based on this finding. It is a now accepted practice that TP53 aberrations should be tested before each treatment decision, and NGS represents an ideal technique for mutation assessment and has the additional capability and advantage above historical techniques to detect clinically relevant mutated subclones. The authors acknowledge members of the Haematology Department, Belfast City Hospital for helpful discussions.
. Prognostic information from cytogenetic analysis in chronic B-lymphocytic leukemia and leukemic immunocytoma. Blood 1985;65:134–41.
. TP53 mutation and survival in chronic lymphocytic leukemia. J Clin Oncol 2010;29:4473–9. Contributors MAC wrote the manuscript and prepared all figures. DG, RC, KM, DD and PT contributed to the writing of the manuscript. Funding KM is funded by Leukaemia and Lymphoma Northern Ireland (LLNI).